Also, will the pedal box affect a warranty claim? Let's say I break down and the car is recovered to VW. I have no chance to remove the box. Will they say "Sir, you have modified the car, we will not honour the warranty"? 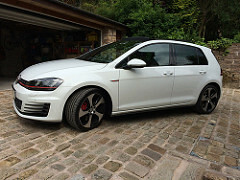 mk7 GTI now sold. Gone but not forgotten. Has the pedalbox affected anyone's insurance or have their insurers been accommodating? Ive had a pedal box on for around 6 months on my pp DSG, its been faultless and I wouldn't be without it. They only time I've turned it off was driving through 4 - 5 of snow, so it wasn't aggressive. What settings or setting do you have it on? Ordered it last night so should be here tomorrow.....tools at the ready! Thanks Eccie - my current insurers are a thieving bunch of arses but I might ask them (if they don't charge me for the privilege). No change on my insurance as it's not an increase in HP. Old, but a serial modder! I've got mine set to Sport 0 or +1. Seems to be a good setting for most scenarios. Fitted today, did have a wee bit bother fitting there plug into my original one from the throttle pedal. Audi S1 gone, awaiting 1.5tsi r-line, pan roof, led lights front and rear, active dash, 18" jurva alloys and a dealer fitted Oettinger roof spoiler in tornado red. Maybe DTUK should ship these in a box marked "beware of the badger"
It really is that good. Using Sport the now. When people say it's like having an extra 20bhp they aint kidding. Just responds from planting the foot. Esso once said " put a tiger in your tank" DTUK " put a badger under your pedal"
Tried one on mine but really didn't notice a huge difference using Sport mode and Sport + was too frantic, returned it in the 14 days but apparently the grey connector had come loose in transit so I only saw £119 of my original £155.95. Mines a manual GTD, interesting to know if people see better results with DSG?